There has to be a better way, there has to be a way to make logs automatic. 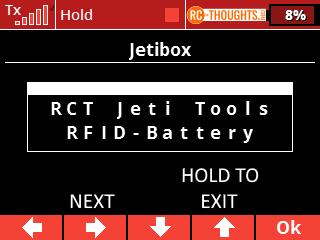 After searching teh interwebs I found this by AlastairC, a simple solution to read RFID-tags with Jeti. So, let’s get the parts and get on it. Revo Bump is a clever technology from Revolectrix, more info here. The good part is that they use a compatible tag and store all kind of information on the tag. They also were kind to share the data-layout so I could confirm my reverse-engineered data-fields. In essence, if you already are using Revo Bump technology you do not need any other tags in your batteries! Hardware used in AlastairC’s example was a bit bulky to my taste so after reading on Arduino + RC522 type RFID-readers I found a bit smaller one. The size is also very close to Arduino Pro Mini board so it makes a tiny package overall. 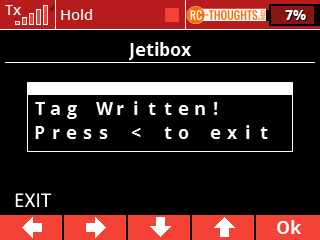 All of us are not tech- or computer savvy so I got an idea to make it writable straight from transmitter via Jetibox. I would have loved to get it writable from LUA-app too but that is impossible for me since it would require access to the closed part of EX-protocol which I don’t have. Middle-PCB kindly shared by Malte Schröder, order from Oshpark here. More info also here. 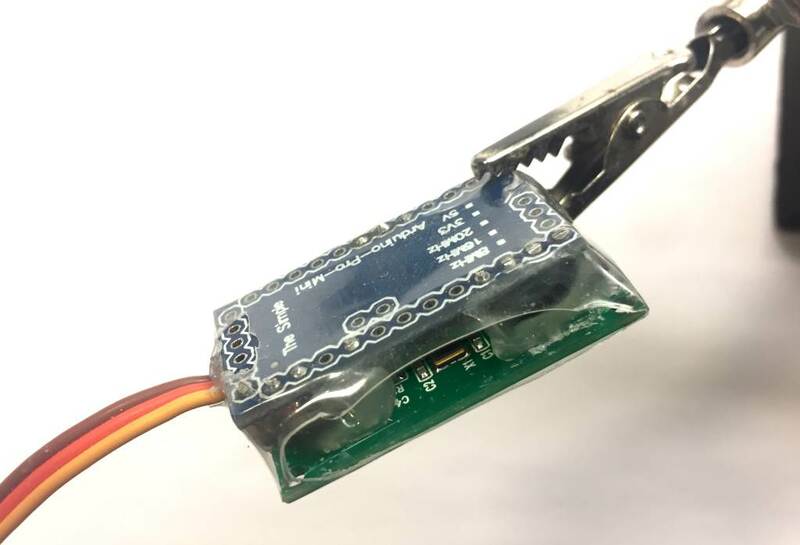 Note about RFID-module: Look pictures below of the sensor (The small green one). The RC522 board needs to be identical and have SPI interface. One vendor had changed the link, so this note is added, link is also updated but I cannot guarantee it to stick. You can use other SPI interfaced cards that have RC522 board too, you need to check schematic yourself. 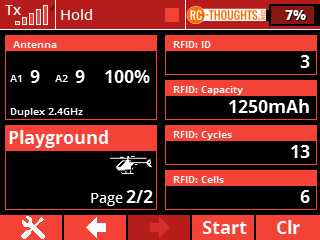 I chose the smallest RFID-reader I could find that was RC522-compatible and had a PCB. 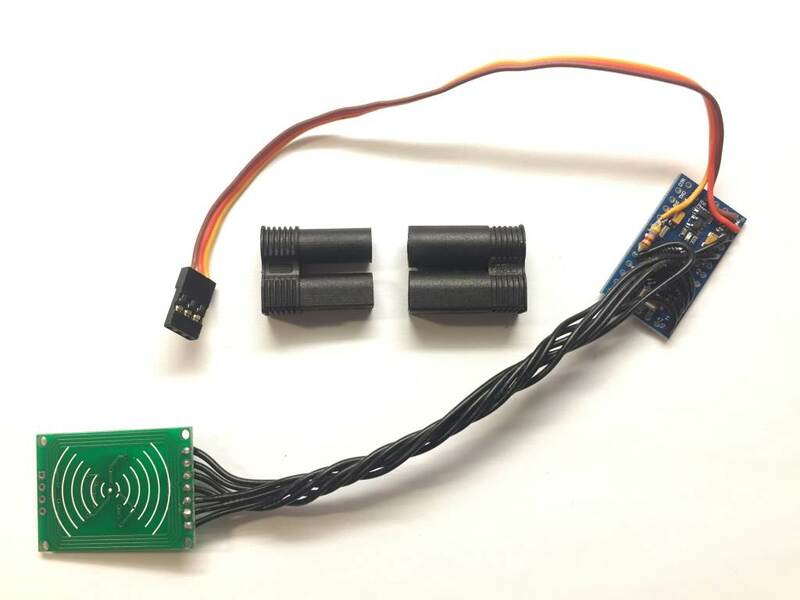 You could use ID12 or ID20-type sensors but making the whole package easy to install would be a bit harder and the size-advantage is really small. There’s very little to do what comes to soldering, here’s the schematic, looks messy maybe but it’s really simple. 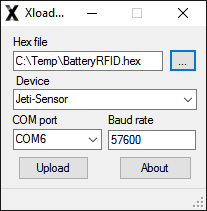 Here is also the reason for using the 3.3V 8Mhz version of Arduino and not the 5V 16Mhz, the RFID-sensor works on 3.3V and we wan’t to keep component-count to as low as possible for cheap and easy building. So, only 19 solder-points in total, quite easy. When doing this you have to remember two things, there’s a reset-button on Arduino, make sure that it’s not pressed in all the time. Also make sure you have access to it even later. I have a small hole in the end of sensor and use a toothpick to press it when I’m re-programming Arduino. (Re-programming is not needed unless there are new features or updates). 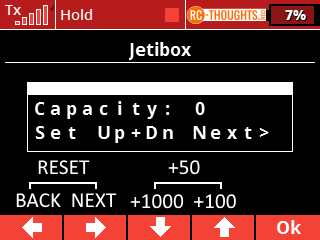 Also make sure you have access to four programming contact-points near the cable, you have to have access to VCC, GND, TX and RX-pins in the end of Arduino-board. 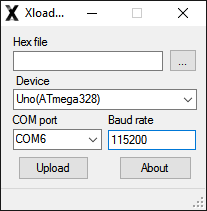 The pre-compiled Arduino file (.hex) from from my Github here. 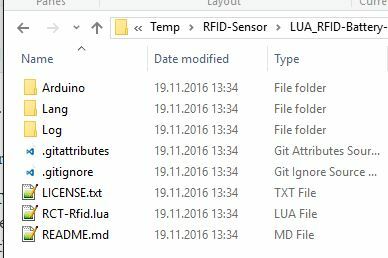 Sensor 1.5 and up is done with Arduino IDE 1.8.0 – Please use the same! Correct libraries and sketch (the actual Arduino-program) from my Github here. 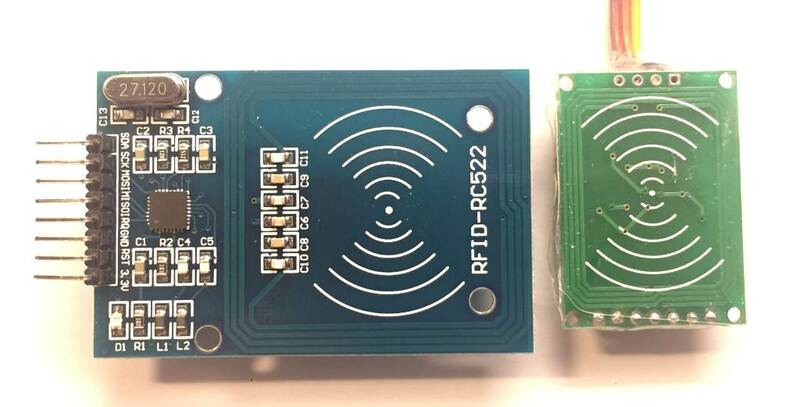 What happens is the power on RFID-antenna is set to max, this makes RFID-Sensor to work at around 3 cm when anti-metal tag is used on battery BUT you will lose reading ability when tag is right on the sensor! Keep this in mind. 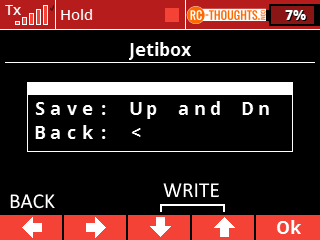 Just when this text appears press the reset-button in Arduino, the “Done compiling” text in the upper picture will change to “Uploading” and when it’s done to “Done Uploading.” If you get errors swap the RX- and TX-pins on your USB to Arduino connection and try again. After programming the Arduino your sensor is ready for use! This is an easy one. Just as any other sensor, that means EXT-port in your receiver, you can also use an expander if you want to. 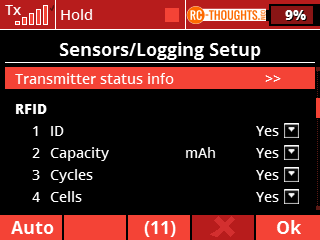 RFID-Sensor is compatible with R- and REX-receivers. 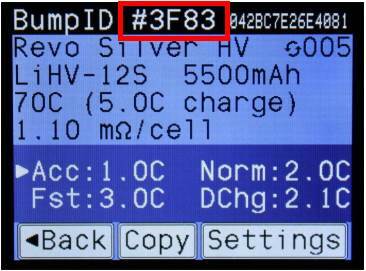 In order to identify different batteries we need to write different values to the RFID-tags we put on batteries. Using Jetibox demands a bit patience, interface is not the fastest one so press a button and wait for a second before pressing again. Last setting is the cell-count. 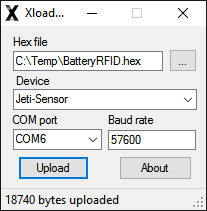 Put the individual battery’s cell-count. If you use two 6S batteries in 12S config it still is 6S you should put here if you use LUA-app. If you always have the same two 6S batteries as 12S and do not use LUA-app you can put 12 in here. (Max = 99). 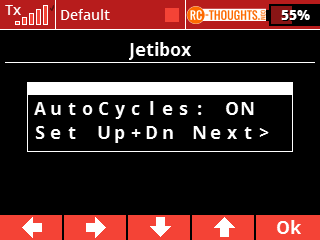 Going right gives us the setting for automatic cycle-count. 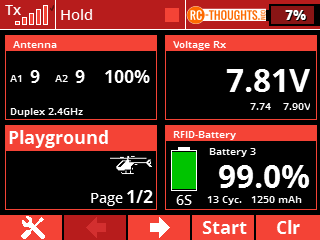 If you have charger that increases cycle-count on RCT-tags set this to OFF so sensor does not increase cycle-count in flight. 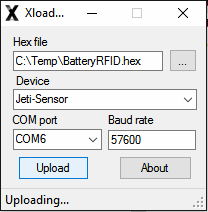 If you have a charger without any RFID-integration this needs to be ON. If this is not set setting defaults to ON. NOTE: Setting is stored on the tag! Does not have any effect on Revo-tags! NOTE to Revo Bump users: While you can go through values (all zeros in start) and change them, you cannot write them to Revo tag. On writing you are presented with a warning. We are not writing anything to Revo Bump tags, ever. 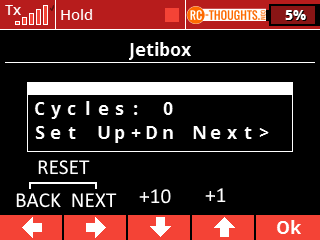 Revo Bump controller takes care of all values including cycle-count. So head on to your controller and change that. Changing the short ID to a number-value (I recommend starting from 1 and going up) does not change any other values or stats you already have on your tag. You can re-write your RFID-tags at any time. You can also change the once written values to your liking any time. RFID works with radio-frequencies and as we know they don’t like metal that much. Same applies here. We are using the most inexpensive tags so they are thin and that means the “antenna” in tag is right on to metal when you fasten it on the battery. There needs to be a little bit of distance between battery and tag. This is easily done with a piece of sot two-sided tape (Ebay example here) between tag and battery. 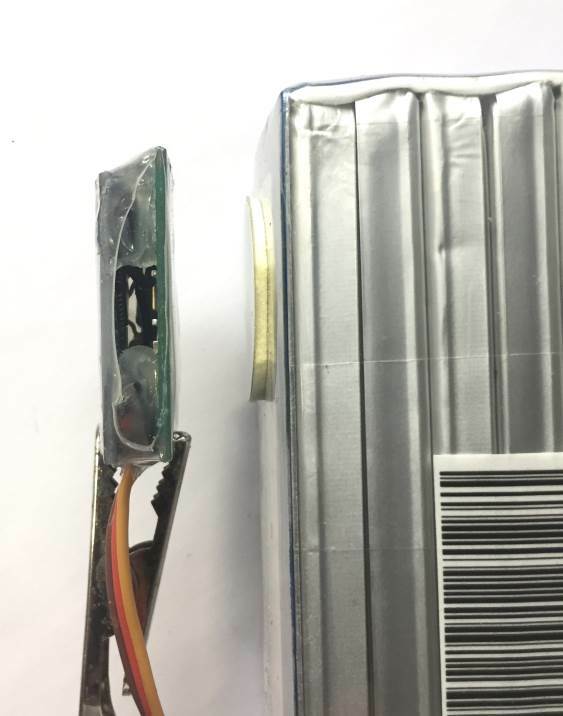 With no battery reading distance is ~3cm, with tag straight on the battery sensor does not read the tag at all. With a piece of foam-tape reading distance is around 1cm which works fine. Thanks for the reminder goes to Onki from Jetiforum.de! You need to test with your model and sensor so reading is reliable.